"Overall, our research shows that excessively high or low densities of coral larvae do not contribute to reef recovery," said Dr Doropoulos. "When larval supply is too low, corals tend not to attach to the reef because they have aggregative behaviour; they prefer to colonise in groups. "On the other hand, when larval densities are extremely high, the post-settlement survival of corals is low because internal feedbacks regulate populations so they don't grow in excess." 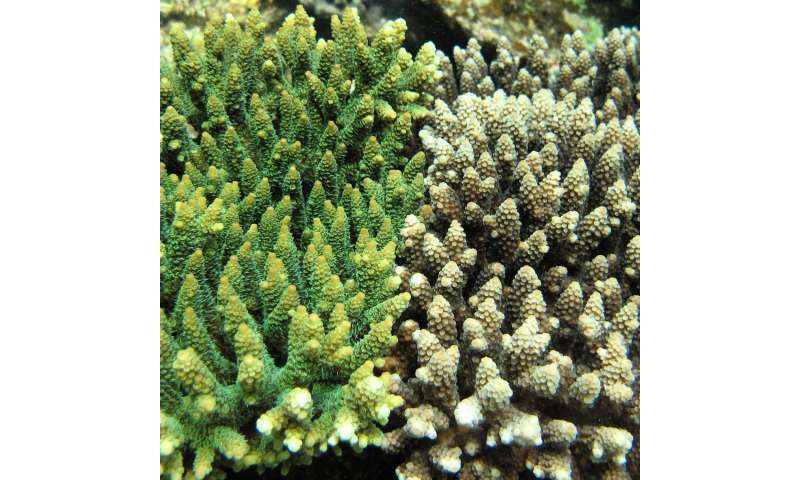 "Coral colonisation involves three distinct life-history stages," he said. "Firstly, corals are transported as tiny larvae following mass annual spawning events. "Secondly, the larvae transition from the water column to undergo metamorphosis and settle on to the reef, after which time they can no longer swim. "Finally, the minute corals need to defend themselves against predators and competitors to grow and survive into colonies that build coral reefs. "Each of these three stages is considered a 'recruitment bottleneck', so quantifying how well corals can transition through each stage is key to understanding how well reefs can recover following a disturbance." "The findings will be important for future reef management," Mr Evensen said. "The recolonisation of coral larvae is a key attribute of reef resilience, and is becoming increasingly important with the cover of reef-building corals declining globally."